The concept of 'secular stagnation' asserts that unemployment remains high and output below potential because investors are pessimistic. This column presents a way to rethink the IS-LM model to include investor expectations. This 'IS-LM-NAC' model explains the slow recovery from the Great Recession, provides a theory-consistent explanation for secular stagnation, and suggests policy options to escape it. Larry Summers has argued that market economies may get stuck in permanently inefficient equilibria. He calls this 'secular stagnation' (Summers 2014). In this equilibrium, unemployment may be permanently ‘too high’ and output may remain permanently below potential, because private investors are pessimistic about the prospects for future growth. Our most recent research attempts to explain why secular stagnation occurs and how economic policy may be used to escape it (Farmer and Platonov 2016). In the wake of the Great Recession, macroeconomic orthodoxy is under attack. Paul Krugman (2011) has called for a return to the IS-LM model, an approach that was developed by Sir John Hicks (1937). We are sympathetic to that call but we believe that the IS-LM model needs to be redesigned. We suggest a different way of thinking about the effect of monetary policy that we call the 'IS-LM-NAC' model. It is part of a broader research agenda (Farmer 2010, 2012a, 2012b, 2016a, 2016, 2016c) that studies models in which beliefs independently influence outcomes. In the IS-LM model high unemployment is a temporary phenomenon caused by sticky wages and prices. In contrast, in the IS-LM-NAC model, high unemployment is a permanent phenomenon caused by pessimistic beliefs. The steady state of our model can be described by three curves: the IS curve, the LM curve and the 'no arbitrage condition' (NAC) curve (Figure 1). As in the conventional model, the IS curve shows all the combinations of output and the interest rate for which the goods market clears, and investment (I) equals savings (S). 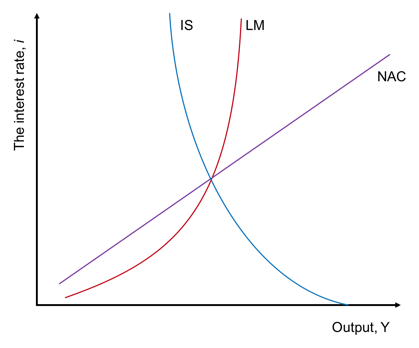 The LM curve shows all the combinations of liquidity (L) preference and the supply of money (M) for which the quantity of money demanded equals the quantity of money supplied. The NAC curve, positively sloped in output-interest rate space, is new. It reflects the 'no arbitrage condition' between physical capital and financial assets. It introduces a channel through which changes in beliefs about the stock market influence the current interest rate. When output is high, dividends are also high, and households receive a higher return for holding claims to physical capital. Competition between equity and government bonds causes the interest rate on treasury bills to also increase. Hence, the NAC curve slopes upward. New Keynesian macroeconomic policy is based on the assumption that prices and wages are ‘sticky’. We assume instead that expectations are ‘sticky’ as a way to explain the real effect of monetary shocks. Following Farmer (1999, 2013), we model this idea by introducing a 'belief function' as a new fundamental. The belief function is a forecasting rule used by households to predict the future. It need not, in general, implement a rational-expectations equilibrium but, in models where there are multiple equilibria, beliefs may be fundamental and rational at the same time. We impose the assumption that beliefs are rational, in the sense that the people in our model are not consistently fooled. In our model people form beliefs about the future value of their stock portfolio. We assume that this belief is sustained and self-fulfilling and we identify it with what Keynes called ‘animal spirits’. A permanent shock that raises animal spirits lowers the unemployment rate forever. A permanent drop in the unemployment rate is possible, because, using the Keynesian search model developed in Farmer (2012b), the labour market of our model contains many possible equilibrium outcomes. We call this property 'steady-state indeterminacy' and we resolve the indeterminacy with our assumption that beliefs are fundamental. Even when the belief function is specified as a new fundamental, there are many feasible values for the price level, all of which are consistent with market clearing. We assume that the price level is set one period in advance, which is in line with empirical evidence. This assumption has nothing to do with menu costs or other barriers to price movements; as in Farmer (1991), it is one of many possible outcomes when the steady state equilibrium of our model is indeterminate. In the IS-LM-NAC model, the long-run effect of monetary policy depends on the way people form beliefs. We study a case we call 'persistent adaptive beliefs' in which people believe, correctly, that shocks to asset values are permanent. When people have persistent adaptive beliefs, monetary policy may have permanent effects on the unemployment rate. An unanticipated shock to the money supply increases the current value of equity capital. Participants in the financial markets believe that this shock is permanent and they incorporate it into their belief of the future value of the stock market. The belief function translates a temporary monetary shock into a permanent belief shock that lowers the unemployment rate forever. In both European data (Blanchard and Summers 1986) and US data (King et al 1991) the unemployment rate is indistinguishable from a random walk. Beyer and Farmer (2007) find evidence that the money interest rate is cointegrated with the unemployment rate and (Farmer 2012, 2015) shows that the stock market is cointegrated with, and Granger causes, the unemployment rate. Our model provides a way to explain these observations. The IS-LM-NAC model can be used to understand how monetary policy influences employment and prices and it explains the failure of existing theory to understand the slow recovery from the Great Recession. It provides a theory-consistent explanation for the phenomenon of secular stagnation and a framework for understanding policies that may be used to escape it. Beyer, Andreas and Roger E. A. Farmer (2007) “Natural Rate Doubts”, Journal of Economic Dynamics & Control 31: 797–825. Blanchard, Olivier J. and Lawrence H. Summers (1986) “Hysteresis and the European Unemployment Problem”, NBER Macroeconomics Annual, Vol 1. MIT Press, Cambridge MA: pp. 15-90. Farmer, Roger E. A. (1991) “Sticky Prices”, Economic Journal 101: pp. 1369-1379. Farmer, Roger E. A. (1999) The Macroeconomics of Self-Fulfilling Prophecies, MIT Press, Cambridge MA, 2nd edition. Farmer, Roger E. A. (2010) Expectations Employment and Prices, Oxford, Oxford University Press. Farmer, Roger E. A. (2012a) “The effect of conventional and unconventional monetary policy rules on inflation expectations: theory and evidence”, Oxford Review of Economic Policy, 28(4): pp. 622–639. Farmer, Roger E. A. (2012b) “Confidence Crashes and Animal Spirits”, Economic Journal, 122: pp. 155-172. Farmer, Roger E. A. (2013) “Animal Spirits, Persistent Unemployment and the Belief Function”, in, Rethinking Expectations: The Way Forward for Macroeconomics, Roman Frydman and Edmund Phelps, eds. Princeton New Jersey, Princeton University Press. Farmer, Roger E. A. (2016a) “The Evolution of Endogenous Business Cycles”, Macroeconomic Dynamics, 20: pp. 554-557. Farmer, Roger E. A. (2016b) Prosperity for All: How to Prevent Financial Crises Oxford, Oxford University Press. Farmer, Roger E. A. (2016c) “Pricing Assets in an Economy with Two Types of People”, CEPR Discussion Paper 11253. Farmer, Roger E. A. and Konstantin Platonov (2016) “Animal Spirits in a Monetary Economy”, CEPR Discussion Paper 11197. Hicks, John (1937) “Mr. Keynes and the ‘Classics’: a Suggested Interpretation”, Econometrica, 5(2): pp. 147-159. King, Robert G, Charles I. Plosser, James H. Stock and Mark W. Watson, (1991) “Stochastic Trends and Economic Fluctuations”, American Economic Review, 81(4): pp 819-840. Krugman, Paul (2011) “IS-LMentary”, Conscience of a Liberal, New-York Times. Summers, Lawrence H. (2014) “Reflections on the new 'Secular Stagnation hypothesis” Vox 30, October.